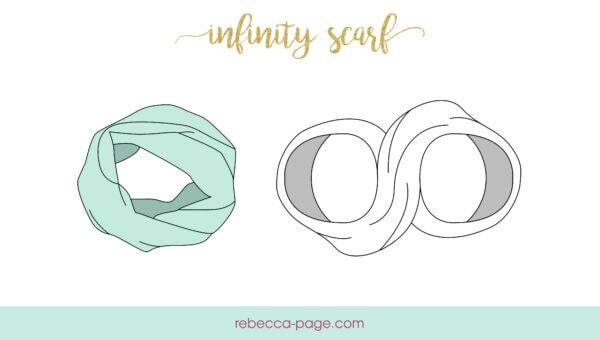 Make an infinity scarf with this FREE adult and children’s infinity scarf tutorial. These scarves are perfect as a cool weather birthday present for everyone. They’re quick, easy, and super cute too! Of course you can always do some selfish sewing and make a few for yourself instead. In this Infinity Scarf Tutorial, I’m going to show you how to make one in either a child’s or adult’s size. Fabrics – Any type of fabric. You may want to adjust your measurements slightly if using a thinner or thicker fabric. Go a bit narrower and longer if using a super thick combo and a bit wider and shorter if using really thin, drapey fabric. Tag your photos with #rpfreeinfinityscarf on Instagram.